"A grilled chicken summer favorite! Here, savory GOYA® Mojo Criollo and sweet GOYA® Pineapple Nectar create a marinade for chicken that couldn't be tastier to eat--or easier to make! Simply marinate the chicken, thread on skewers with vegetables, and then grill. Try it tonight, and you'll see why these Tropical Chicken Skewers have become our signature grilled chicken dish this summer!" In large container with lid, or in large zip-top bag, mix together chicken, Mojo, nectar and Adobo until coated; transfer to refrigerator. Marinate chicken at least 2 hrs, or up to 24 hours. Strain chicken, discarding marinade. On each skewer, alternately thread pineapple, chicken, onions and peppers. Prepare grill to medium-high heat (or heat oil in large grill pan over medium-high heat). 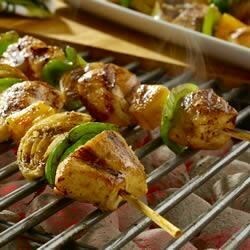 Cook skewers, turning once, until chicken turns dark golden brown and cooked through and vegetables are tender, about 15 minutes. Transfer to serving platter; serve warm. Spicy chorizo sausage adds big flavor to lean chicken and veggie skewers. Grill Marks Guaranteed! To ensure your grilled chicken develops golden-brown grill marks, remember these grilling tips: First, make sure the grill is piping hot (about 500 degrees F). Then, place chicken on the grates and let it cook, untouched, for at least 5 minutes (or up to 7 minutes). Then, flip once. Allowing the chicken to cook undisturbed over the hot flame will give the heat enough time to create the sear marks you love. Quick easy and had a lot of flavor.